Vivian Gornick’s relationship with her mother is difficult. At the age of forty-five, she regularly meets her mother for strolls along the streets of Manhattan. Occasionally they’ll hit a pleasant stride – fondly recalling a shared nostalgia or chuckling over a mutual disgust – but most often their walks are tinged with contempt, irritation, and rages so white hot her mother will stop strangers on the street and say, ‘This is my daughter. She hates me’. Weaving between their tempestuous present-day jaunts and the author’s memories of the past, Gornick traces her lifelong struggle for independence from her mother – from growing up in a blue-collar tenement house in the Bronx in the 1940s, to newlywed grad student, to established journalist – only to discover the many ways in which she is (and always has been) her mother’s daughter. 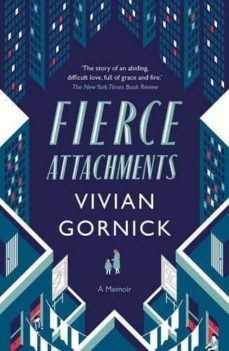 Fierce Attachments is a searingly honest and intimate memoir about coming of age in a big city, and the perpetual bonds that keep us forever linked to our family.